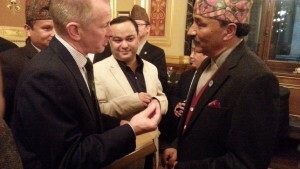 A reception was held in the evening of Wed 16 Dec 15 at the Foreign and Commonwealth Office in London in order to celebrate the bicentenary of diplomatic relations between the United Kingdom and Nepal. 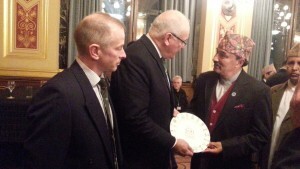 The event was attended by a huge number of dignitaries and people from all walks of life. Col Comdt, Gen Sir Peter Wall presented a G200 commemorative plate to the Deputy Prime Minister and Foreign Minister of Nepal, HE Mr Kamal Thapa. Also present at the reception were Col BG, Col James Robinson and members of the BG, both serving and retired.